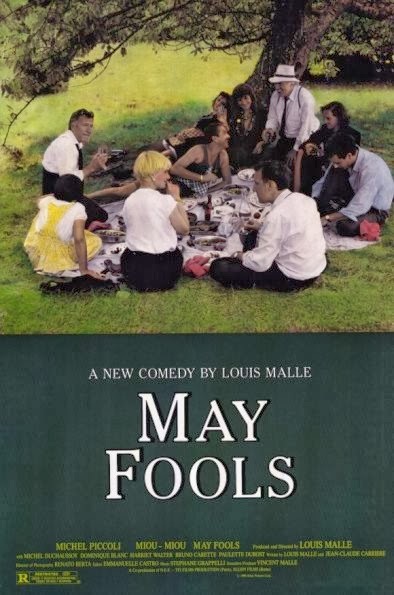 With May Fools Louis Malle created a charming, layered, disarmingly dense, bittersweet and deliberately obtuse piece on an iconic event in recent Parisian history, viz. ‘May 68’. Though set outside the city and the spontaneous uprising takes place in the background, the revolutionary fervor, leftist spirit, anti- establishmentarian mood and socio-political turbulence of the event was marvelously captured in the film. It opens at a sprawling villa in the Parisian countryside with the extended family members getting together upon the death of the family matriarch. As can be guessed, family secrets, pent-up anger, repressed desires and the various emotional and inter-personal complexities therein start getting exposed, with layers peeled one at a time. Meanwhile, as the events of May ’68 unfold, it provides a combination of illuminating, startling, deprecatory and revelatory observations about the glibly bourgeois set-up that the story ironically, and with wry humour, focused on. The ensemble cast comprised of the deceased lady’s likeable son Milou (Michel Piccoli) who’s the acting caretaker of the estate, his prim but neglected married daughter (Miou-Miou) who sparks afresh the unreciprocated love of the family lawyer, his intellectual brother (Michel Duchaussoy) who can’t keep off the radio and his alluring trophy wife (Harriet Walter), Milou’s vivacious, frigid and homosexual niece (Dominique Blanc) who’s highly possessive of her pretty young girlfriend who in turn becomes attracted to a rebellious guy her age, a hilariously coarse truck driver who joins the group, and so forth. The playful mood, satirical tone and rambling narrative wonderfully masked the serious themes and sharp commentaries, nicely accentuated by top-notch performances, gorgeous photography and the perfectly evoked zeitgeist. I haven't seen this many years, but your marvelously sensory piece brings it all back into focus Shubhajit! Thanks Sam. Malle sure has such a diverse filmography!! !